What is This Thing Called Displacement? I hope all is well with you. The article below was written by Ken Hankinson and I think it’s a very thorough explanation of displacement and boat design… enjoy! Every once in a while we get our inventory of books and supplies delivered with slight imperfections in the packing material or we have overstock on some parts. Instead of destroying these and eating the loss, I’d like to offer you a chance to get items at a great price. Get ’em while supplies last! now! What is This Thing Called Displacement?Legend has it that when Archimedes discovered the basic principle of buoyancy some 2000 years ago by stepping into a bath, he became so excited that he ran home without his clothes on, shouting “eureka, eureka” (“I have found it, I have found it”). Contrary to what you might think, what old Archy really found was that when a person stepped into a full tub of water, the weight of water that flowed over the sides weighed EXACTLY the same as that of the body then immersed in the tub. Naval Architects refer to Archimede’s principle as the basic law of flotation, which means that any floating object, such as a boat, will push aside or “displace” a volume of water equal in weight to that of the floating body. Thus “displacement” in boat design refers to the weight of the boat AND everything carried aboard at any given time. It is important to note that displacement is NOT the same as “boat weight”; displacement is ALWAYS MORE than boat weight. So what, you say? The distinction can be important. 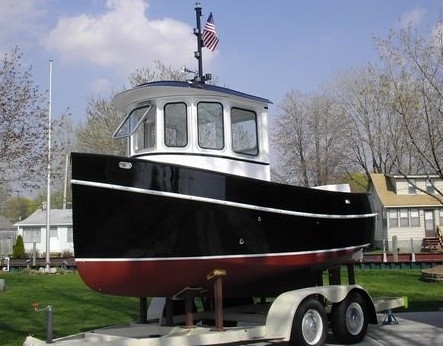 When a professional designer designs a boat, he will start out with a preliminary weight estimate usually based on experience with past designs and boats of similar size and type, assuming certain conditions of fuel, passenger loadings, etc. Then he will design the boat in such a manner to arrive at an underbody (or immersed portion) in a form that provides the proper displacement as well as the desired performance qualities. Certain other calculations and coefficients are then made, based on this underbody design to predict the performance and other characteristics of the hull. If the designer has been careful in all this work, and the builder carries out the project properly, and the user loads the boat in the prescribed manner, the boat will float evenly on its designed waterline, and hopefully perform as expected. On the other hand, if the designer was unrealistic about his weight estimates, or the builder altered the structure, or the owner overloaded the boat after it was launched, or any number of other variables took place which alterred the designed displacement (the weight of the boat once in the water ready to go with passengers, fuel, water, etc., aboard), any one or a combination of the elements of performance, trim, balance or stability could be adversely affected. Thus, it can be important to know not just the weight of a boat, but also its designed displacement and loading capabilities, especially on boats bigger than 20′. All too often boat salespeople, advertising copywriters, and even a few designers are less than candid on this subject. Most people know that excessive weight is usually a detriment to performance and economy. So instead of listing the actual theoretical designed displacement figure, boat weight gets listed instead, which will be less than the displacement. What’s even worse, they will disguise or even lie about the term. For example, sometimes you’ll see the term, “boat displacement” meaning boat weight or “dry displacement” meaning no fluids or passengers aboard. These terminology tricks are often seen with regard to the smaller trailerable racing sailing yachts, giving the false impression that they are lighter and faster than they actually will be once the crew is aboard with all their gear. For the trailerboater, knowing the true displacement can be important in the selection of a trailer. Minimum traierable weight is important for fuel economy, and a trailer with too much capacity is not only heavier, but probably more expensive. However, it can be a mistake to select trailer capacity merely on the dry weight of the equipped boat. It is better to pick the trailer capacity based on the boat’s displacement, which as stated earlier is ALWAYS more than boat weight. The reasons are simple. Boats that are trailered are commonly loaded (and sometimes overloaded) with all the gear that each crew member expects to use on the forthcoming voyage, frequently including full fuel and water tanks. Local fuel prices are often cheaper than those charged in boating resort areas, so it’s common to fill up the tanks before leaving home. Thus, the only differences between displacement and actual trailerable weight will be the crew members themselves riding in the tow vehicle. The difference in listed displacement and the trailerable load caused by the crew members not being aboard gives a safety margin in most cases, easing the load on tires, wheel bearings, and brakes, which is especially welcome on hot summer days when towing across the desert at maximum legal speeds. For the person building his own boat, knowing about displacement and the designed waterline is also important. The person who designed your boat had definite things in mind when he started out with the design, such as the capacities and location of tanks, engines, sail plan, ballast type, and equipment, not to mention specific types of hull materials and their sizes or “scantlings”. While it is common to deviate from plans to some extent, and may be one of the main reasons why you chose to build your own boat in the first place, don’t attempt to “second guess” the designer and make the structure “stronger” by “beefing up” the scantlings. 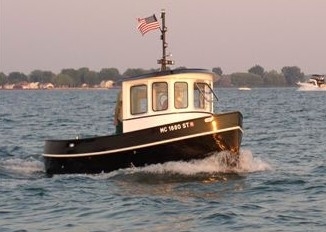 And what may seem to be a harmless increase in cabin height to obtain full standing headroom, or adding a flying bridge when none was shown originally, or adding sail area by adding mast height, can not only sink the boat deeper than intended, but may affect the balance, trim, stability and ultimate safety as well. When such modified boats are launched and they commonly sink beyond that beautiful boot top demarking the waterline that required such careful work, who gets the blame? Usually the innocent designer who had no real control over the situation. 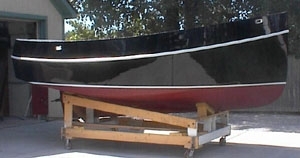 Even in those cases where a boat has been built “exactly to plans”, so to speak, there are often variables that can make one boat heavier than another even if of the same design. For instance, while a designer may specify the capacity and location of tanks, one builder may use aluminum or plastic tanks, while another may use stainless steel which is heavier. One builder may use a lighter weight wood than another, and in fact, even within the same lumber species, weights from board to board can vary dramatically. Then too, a given horsepower range may be recommended for the engine and one builder might pick a heavier, higher powered engine over the builder who picked a less powerful, lighter weight engine. Keep in mind that displacement is a theoretical ideal, a goal that the designer and builder seek to reach. However, while a designer bases just about everything on this theoretical figure, in the real world on any boat, the true displacment figure is a constant variable, especially on power boats. Although designers often base their displacement figure on a boat at half fuel and water with a certain number of passengers and nominal amounts of gear aboard, fuel does get consumed, beer cans get emptied, food gets eaten, gear gets added or subtracted, and crew members may come and go. Just remember, however, that a boat usually performs best that “floats on its line”. Watch out for overloading, especially when it can affect trim or stability; an unsafe boat can be the result. 7 Responses to What is This Thing Called Displacement? 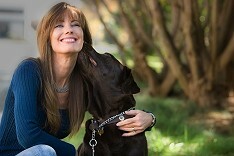 I sure enjoyed reading your article on “Displacement” – as I do all your articles; very informative, and always encouraging. Thank you very much! I enjoy receiving all the information from you. I haven’t had time to begin building a boat yet but will probably try it soon as I am about to retire. I have a lot of recycled lumber I might practice on. Think that would be fun. Thanks so much. 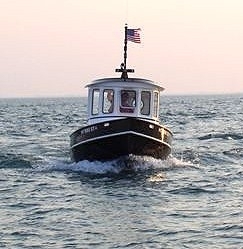 Great article on a fundamental of boat building that is often misunderstood. Anyone building a boat and especially someone considering modifying a design needs to read this clear and concise explanation of displacement and how it relates to the overall project. Thanks for posting it. You clarified an important principle in boat building. 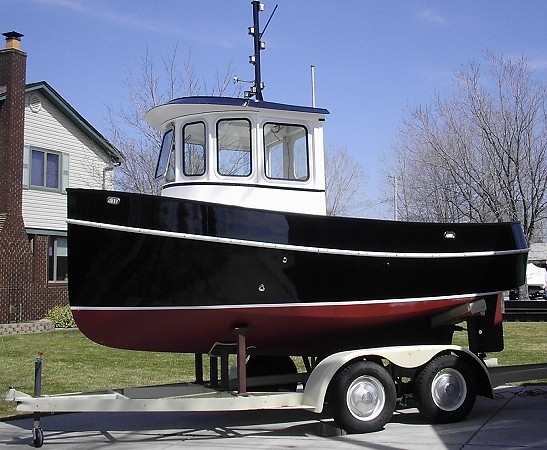 Readers and amateur boat builders should know well that enlarging a boat is not simply a matter of increasing lengths. Thanks for the article.